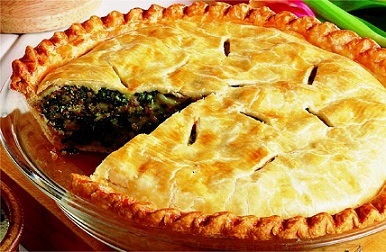 For the restaurant recipe for this Spinach and Sausage Pie Casserole you should select your favorite sausage, one that will give the casserole "the punch" you prefer. My personal favorite is a good Polish sausage! That is the way I make it to serve at the restaurant and the guests really enjoy it. I do not recommend using fresh spinach for this restaurant recipe. You would have to cook a very large pot of spinach to achieve the amount called for in this casserole recipe and then you would have to squeeze out all the moisture and chop it. Preparation time: 30 minutes. Serves 6-8 depending on portion. 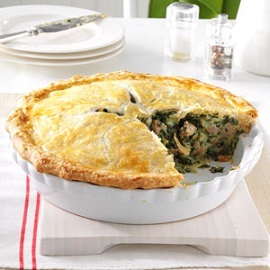 The restaurant recipe for this spinach and sausage pie casserole is really complemented when served a favorite restaurant salad recipe. Try the Endive Salad with Apples, Walnuts and Bleu Cheese. If you are short on time you can purchase a quality pie crust at a supermarket although it will not be as good as the one you could make. 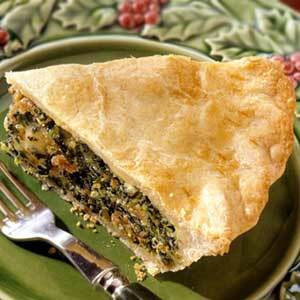 Enjoy your Spinach and Sausage Pie Casserole and the company of those your share it with! Enjoy all of these real restaurant recipes.